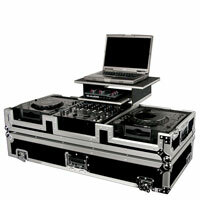 Whether you DJ with CDs or a computer, the American Audio, Radius 1000 will help you achieve the next level! The Radius 1000 is a professional CD/MP3 player with Midi capabilities so DJs can control their favorite music playback software. 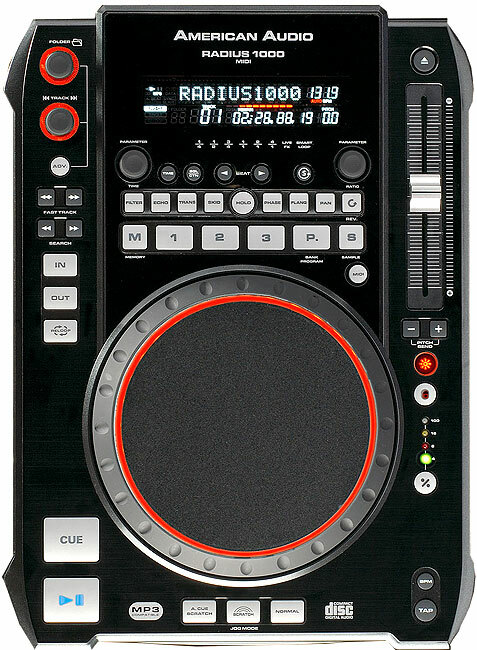 It features a large 6-inch (150mm) jog wheel, 9 on-board DSP effects, and a large bright display that shows track titles and artist ID tags. Radius 1000 has a red LED visual marker display that rotates around the jog wheel to show the reference point of where the CD/MP3 disc is playing. The Radius 1000 also offers features only found on the highest quality CD Players, such as: Slot load CD Drive, Quick MP3/CD disc recognition, Advanced Track Search (search for a new track while one is playing), 10 seconds of Anti-shock memory, Seamless Loop, 3 Flash Start buttons, Digital BPM Counter, and Digital Output (S/PDIF). Weight: 8 lbs. / 3.6 kgs.